« What Yale Senior Society Should You Be In? A suspected Bronze Age sword with a gold hilt that may be up to 4,000-years-old has been uncovered on the site of a new community football pitch. Diggers moved into the site in Carnoustie, Angus, in Scotland after a collection of relics were unearthed while workmen began laying foundations for the new sports field. Work to the playing fields has now been halted while archaeologists scour the site. 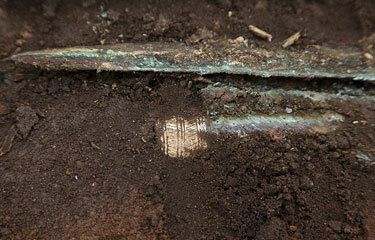 The find appears to be a sword with a gold hilt, or handle, dating back to the Bronze Age. It looks as though it could be two items – possibly a spear point or a broken sword. Due to the fragile nature of the find it has to be specially lifted out in order to conserve it for experts to examine in a laboratory.